On Baranof Island in southeast Alaska there are a pair of unnamed glaciers at the headwaters of the Carbon Lake watershed, that then drains into Chatham Strait. 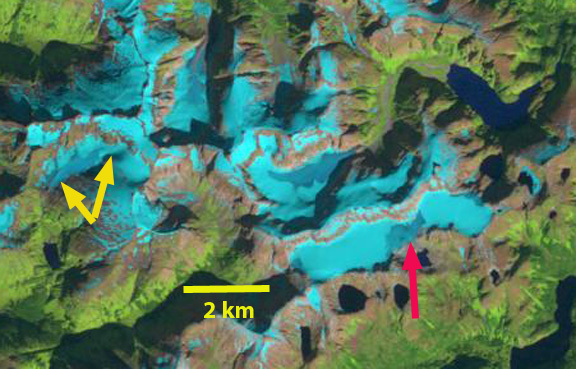 Here we examine changes in these glacier from 1986 to 2014 using Landsat imagery. 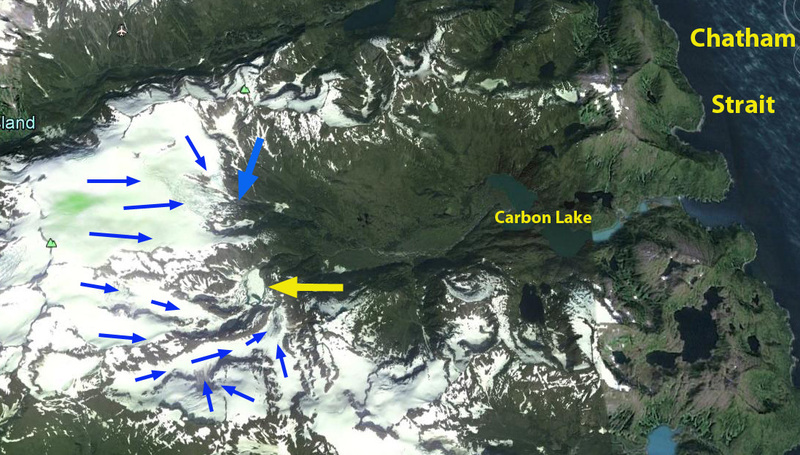 The blue arrow indicates the northern glacier terminus and the yellow arrow the southern glacier terminus region. In 1986 the southern glacier terminus, yellow arrow consisted of three main tributaries combining to form a low sloped terminus region. The northern glacier had a single terminus. 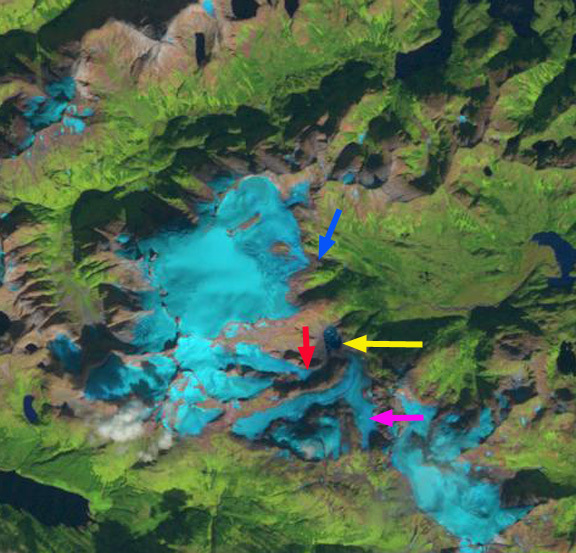 By 1997 a lake has formed at the southern glacier, which now has two separate termini, the red arrow indicates a new terminus area and the pink arrow the eastern portion of this glacier. 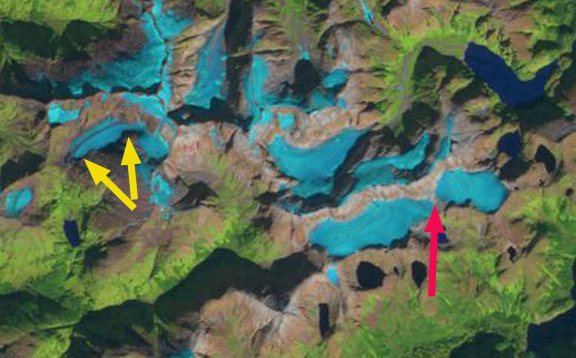 The northern glacier, blue arrow, is retreating but still joined. 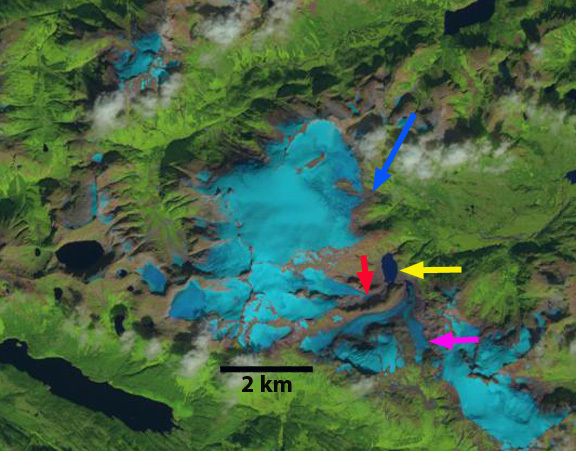 By 2014 the southern glacier has separated into three parts. There is a terminus at the red arrow, this represents a 900 m retreat since 1986. This portion of the glacier has further separated since 1997 into two parts. 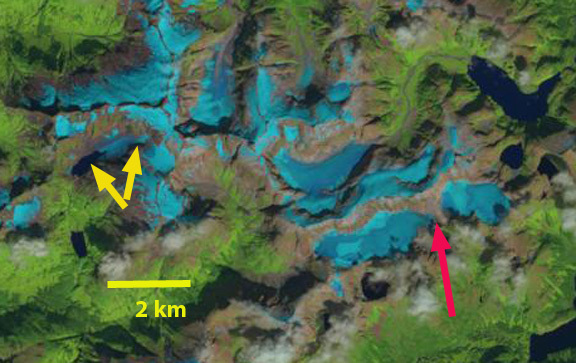 The eastern glacier, pink arrow has retreated 700 m since 1986. The new alpine lake is 600 m long. 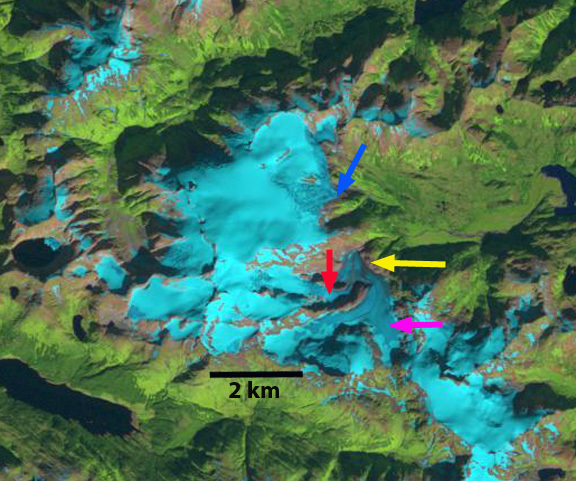 The northern glacier, blue arrow, has separated into two main termini and the glacier has retreated 200 m. The retreat of these glaciers paralells the observed losses of other smaller glacier in the region most notably Lemon Creek Glacier, which is a World Glacier Monitoring Service reference glacier, 30 km west on the edge of the Juneau Icefield. Another nearby example is Sinclair Glacier. Lemon Creek Glacier has lost more than 25 m of glacier thickness during the 1953-2014 period when its mass balance has been observed by the Juneau Icefield Research Program, and has retreated more than 1 km.